Clash of Clans is a popular video strategy game that is made for all smartphones running on both Android and iOS platforms. This game allows gamers to build their own clan and upgrade everything inside it like the castle, wall, towers, various troops, etc. Aside from being well liked, COC turns out to be an addictive game, that’s why many players record Clash of Clans and share their own gameplay online to show how good are their troops, their castle, and what strategy they used. However, there are still some Clash of Clans fanatics that do not how to capture their gameplay. In this case, looking for a how-to guide is what you need, just like the ones shown in this post. Before, recording iOS screen seems to be impossible to do. But that’s in the past for you can now record your favorite Clash of Clans moments using a professional tool called Apowersoft iPhone/iPad Recorder. This app supports streaming any data from iOS devices to computer and recording screen. It also supports various audio inputs, in this way, you can successfully record in game audio along with your commentary via microphone. Plus, it also offers a screen capture function for taking screenshots. 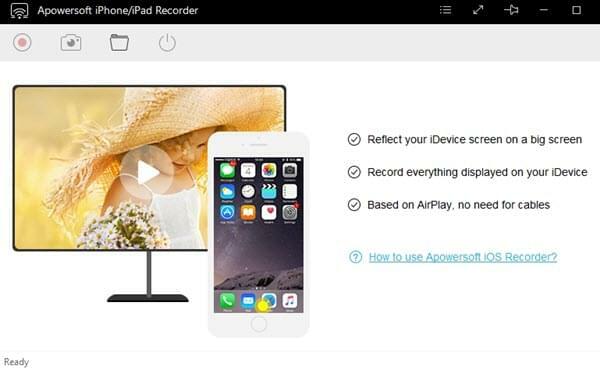 All these features make this tool a useful recording package, enabling anyone to capture their important activities on their iOS devices with just a few clicks. 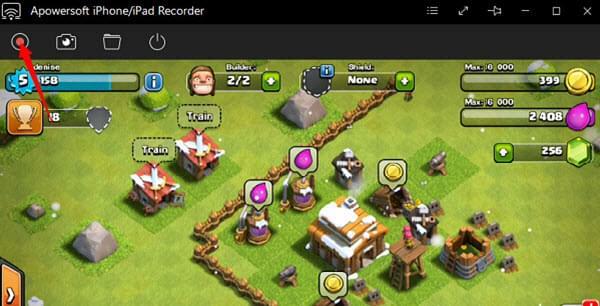 Here’s how to record Clash of Clans with this tool. Download and install the app by hitting the download button below. Launch this program and go to options to set output folder and format that you like. Then set your PC and iPhone in the same Wi-Fi, then open the Control center in your iOS device and tab “AirPlay”, enable “Mirroring”. Now the recording bar will appear along with your mirrored screen on PC. 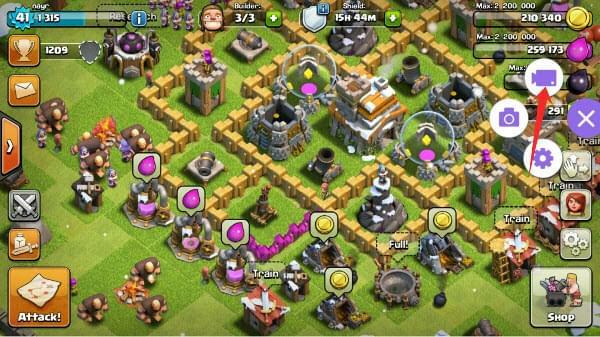 You can then open your Clash of Clans account and play as you desire. To begin with the recording, just hit the red “Record” button located at the upper portion of the app. 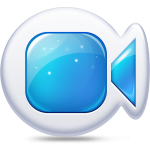 Hit the “Stop” button to end recording and the recorded clip will be saved on the output folder that you’ve set. To record another one, simply repeat the process. Moreover, after recording Clash of Clans video, it is important to transfer it into your own iOS device, so that you can watch it anywhere you go. There are different ways to move your video from PC to iOS, yet the easiest and most convenient way to transfer video is by using the online version of Apowersoft Phone Manager. 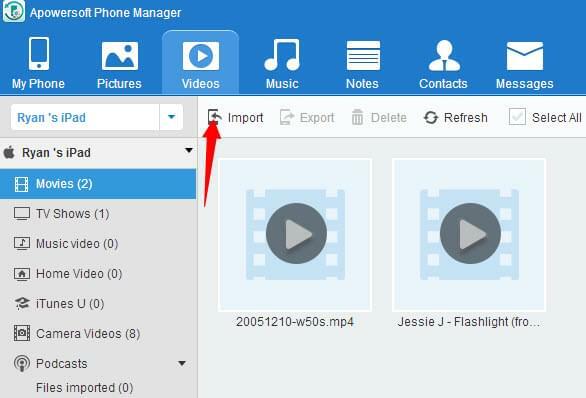 Transferring video clip can be done by going to the official page of Phone Manager and click “Launch application”. After that, connect you iOS device to PC via USB cable and your device will be instantly detected by the tool. Once it is synced, all of your iOS’s info will be displayed. To transfer the video, just click the “Videos” tab, then “Import” to open the video that you prefer. The transferring process will then start automatically and will be ready in a moment. If you are an Android user, the best Clash of Clans recorder for you to use is a mobile app called Apowersoft Screen Recorder. This is a free application which you can get from Google Play store. 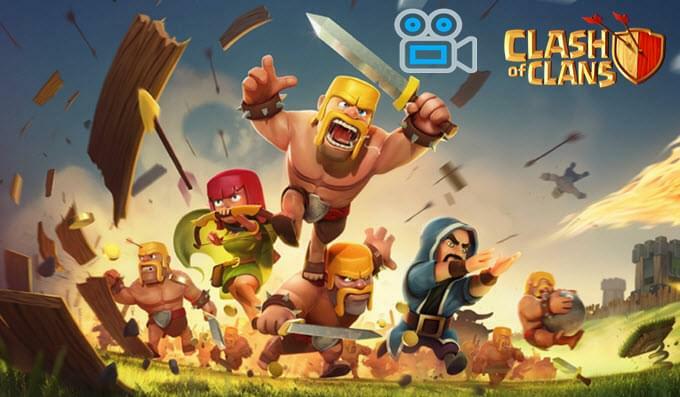 With this app, users can record anything from your screen including games like Clash of Clans. It also supports front camera recording, which is useful in making commentaries while recording your gameplay. Plus, it has an overlay for icon for more flexible Android screen recording. Other good things about this app includes various recording preferences that can help you choose the right quality that you like for your videos, a sharing function for instantly sharing your recorded clip and a screenshot function that you can access from the overlay icon. To use this app, simply follow these steps. Get this tool from the button below. Open the application, then navigate to options to configure desirable settings and enable overlay icon. Click the camcorder’s icon on the center the interface, and press “Start Now”. The recording will then start automatically. Next, open Clash of Clans and play, then tab overlay icon and press start recording to capture your castle, a clan war or others. When you’re done, simply tap the “Stop” button, which you can access from the overlay icon. The captured video will then be included on the recording list. Another way to record Clash of Clans gameplay is by using the new recording feature that was added on the latest Google Play Games update. This function enables gamers to record their screen activities either in 720p or 480p. It also allows gamers to record their front camera, which is helpful in making picture in picture recording. After recording, you can edit your captured video clip and upload it directly to YouTube. To record gameplay with this app, here are some guided steps. Install the latest Google Play Games and Open it. Now, you can see all of the games that were installed on your Android device. Look for Clash of Clans and tap “Record Gameplay” and choose the quality that you want for your recording. Your game will then be launched automatically along with an overlay icon. To begin the recording, simply tap the “Record” button and play the game at your will. To end the recording, tap the “Stop” button and your captured video will be saved under Gallery. This is a decent app to use. However, its function is limited with just screen recording and it’s not available in some countries. Those are the various ways on how to record Clash of Clans gameplay. With these tools, every Clash of Clans enthusiast can record their favorite game achievements easily both on Android and iOS.